Heavy duty English boot bag to carry boots, whip, gloves and accessories. Made with water proof 420D poly nylon. Heavy duty English boot bag to carry boots, whip, gloves and accessories. Made with 420D poly nylon. Fully foam padded with fleece lining. Center divider to keep boots in two separate compartments, two 8"x4" accessory pockets with Velcro closure, whip carrying slot on back. 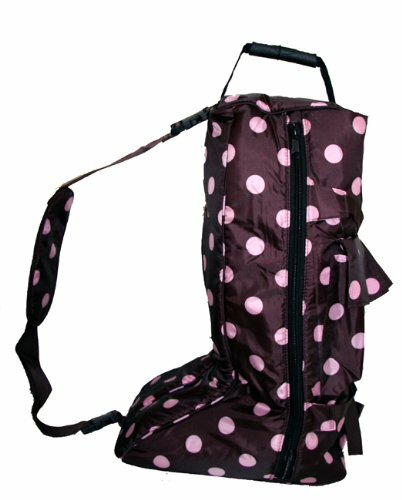 Comfortable soft rubber handle, four rubber foot pads on bottom, removable/adjustable shoulder strap with 'sliding' pad. Size: 25" x 16" x 10"
If you have any questions about this product by AJ Tack, contact us by completing and submitting the form below. If you are looking for a specif part number, please include it with your message.